This was to have been my last post for a while. I felt tired, and stretched, and wanted to see what would happen to my writing if I left it fallow for a while. And then, I met Pripyat. Stories are like drugs. They entrap you, and you are in their power, and like the girl with the red shoes you must tell them because they demand your fingers to fly over the keyboard and relate them once more, though firesides are gone and how much longer will people read anything longer than 100 words? 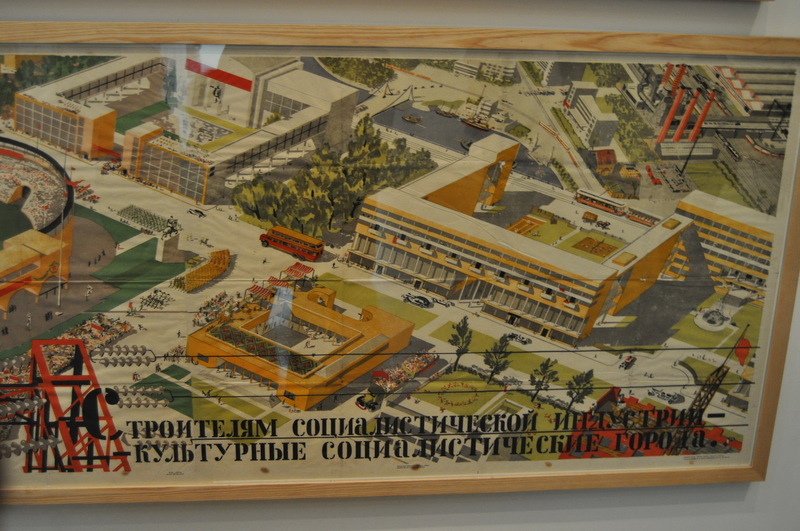 If you stroll into the Tate Modern and take a lift up to Level 5, and turn right and walk until you can walk no more, you will find the Russian propaganda posters. There are all the usual horror-posters about keeping secrets and doing what the state tells you to; and then there is a set of pictures of the perfect socialist town. They are by a man called Cherkes – I’m thinking this might be Daniil Yakovlevich Cherkes, about whom the glorious Union of Soviet Socialist Republics seems to have saved little information before its demise. The prints are lithograph on paper, dated 1932. It’s one of the oldest tricks in the town planner’s book: social engineering. Look at the space! The greens where children can play as grow ups watch! This is ideal in every way. On February 4, 1970, the members of the Party of the Soviet Union looked on as the first peg was hammered into the ground to begin construction of a new town. They had chosen their place carefully. Situated next to the Pripyat River, in Northern Ukraine, a railway station was already close by and a highway led to the site. It was perfect in every way. 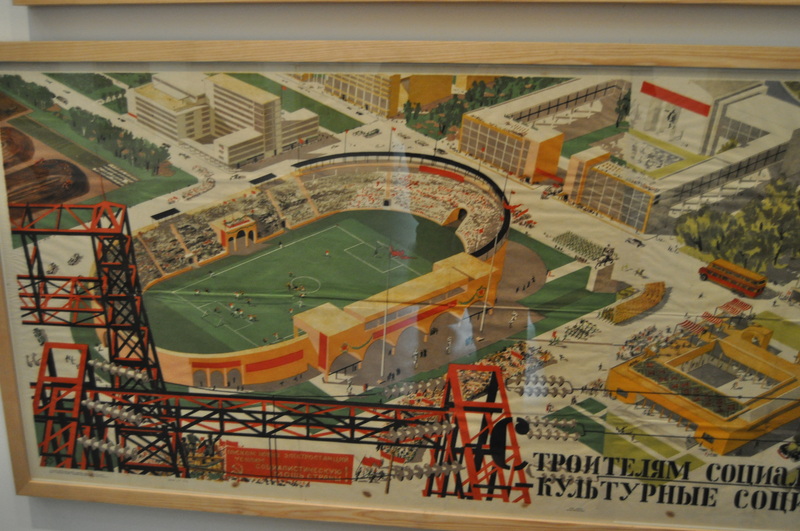 The planners, like Cherkes, had made something beautiful for the people. They planned meticulously, retaining every inch of green space and each mature tree. The people of the town of Pripyat were to have a little Utopia in which to live and breathe. Which is good, because they were going to be working very hard, at the nearby nuclear plant. There were parks and gardens and four libraries and ten kindergartens.The people wanted for nothing: there was an art school, and bookstore, and medical institutions, cinema, amusement park and theatre. With an average age of 26, the workers were a young and vibrant lot. It is said that in the evenings, when the workers arrived home from the plant, the streets would be full of parents with babies in buggy strollers, taking the evening air. In 1979 the population had grown so much that Pripyat was declared a city. People thrived here: it had been designed to be one of the most beautiful cities in the Ukraine. And I am sure you know the end of the story. Today, Pripyat has a population of zero. It is surrounded by a Zone of Alienation, because its local nuclear power plant was named Chernobyl. The pavements where strollers wheeled with such optimism are silent, and the place has become a place where only the curious venture. The city is crumbling, and the buildings collapsing. The city has one great roaming ghost, and its name is Radiation. It is a plaintive fate for socialist industry, and the Cultural Socialist Town. Thank you, Cameron Garriepy, for this site about the 33 most beautiful abandoned sites in the world. Thank you, Elspeth, for those kind words. I appear to be still writing at the moment, but we shall see what transpires. Even if you only posted a tiny blog post occasionally, I would still be enthalled and enchanted by your writing. The tiny-ness of it, however, might not satisfy you. I don’t have the same daily duties pulling at me like a lot of bloggers. I don’t see how those folks get any writing done at all. Your work is a beauty. Please don’t leave it sitting there like Pripyat. Ruth, what an incredible comment, I feel most privileged to recieve it. And you are most perceptive. I write for myself mainly: it has always been my leisure. The act of sewing together shreds of material from different places is revitalising, most of the time, and a small piece does not really give me the scope to do that. Pripyat: I shall try and avoid that! Thanks as always, Brett. Tomorrow’s post is written, and it almost wrote itself. Habits die hard, don’t they? What a story. I didn’t know the exact location or the history of Pripyet, so the moment you mentioned Chernobyl, I actually had chills. Cameron, thanks for that post on Facebook. Really moving! As you say, each photograph could fuel a novel. A wonderful stimulus. I always think of the wolves: I heard a documentary on our radio station about how they are reclaining the wilds of Chernobyl. There are old women who would not move out and live, surrounded by them, I recall. Very gloomy post, what with all the sabre rattling from Pyongyang. It is, though I live in hope that all of that is behind us, Roger. I have a great affection for Dungeness and its strange situation. A very sad reminder of a horrible time. On the matter of you letting your writing lie fallow for a while, we would all be the lesser for it. However, do what is best for you and the family, we will be here for you. Thanks, Lou, I appreciate it. I sit here tonight with a post already written for tomorrow: the material was just too rich not to share. I expect I shall have a little holiday sometime soon, though. Dear Kate, your story today was both sobering and sad. Actually, deeply tragic. Taking time away from blogging seems, to me, essential for most of us. I used to post three times a week, and now I post only on Wednesdays. I just couldn’t keep up with the writing and with the responding to comments. So I applaud your generosity to yourself. As the Hebrew Scriptures say, “For everything there is a season.” And surely there is a season for writing a blog and for resting. For lying fallow. Writing is labor. It may be a labor of love most of the times, but as with all labor it makes demands on our bodies and our minds. And when it makes demands on my spirit, then I know I must take a timeout. Please, Kate, be good to yourself. Peace. Wise words, Dee, thank you so much. I expect I shall act on them 🙂 Peace to you, friend, as always. Another socialist ideal gone wrong! Indeed, Tandy. So many of those idealistic plans never quite worked out, did they? Give yourself permission to write . . . and permission NOT to write. Give yourself permission to post once a day, once a week, once a month, or once in a very blue moon. Give yourself permission to vary the length, depth, and breadth of your posts to accommodate the time available. Give yourself permission to write without rules. Or to refrain from writing at all. Thank you, Nancy. Excellent advice, as usual. Permission is a very perceptive word to use. Nononono! That Refrain from Writing is far too full of discords and should not be played. Kate, you have so much to be dealing with, what with life being life, and you being you. Experiment with rest, you might even enjoy it. Do what you need: you and yours need you to be not tired, not stretched. If blogging nourishes you, keep at it in a way that works. If not, step away. Whether it makes a difference or not, I will post the same comment I did on Tom’s blog. Both Google and Facebook have been tinkering with the internet in recent months, and it has impacted how we are all seen online. Some more drastically than others. For a while, I let it take the joy out of blogging for me. Then, I had to realize that I blog to see people like you every day. You’re like my extended family, and I will miss you horribly if you are not here. That being said, you must do what is best for you, what you need to feed your soul. The photos of Pripyat today are very moving. So chilling to see the end of what started out of such good intentions. Even sadder is idea of the old women surrounded by wolves. It sounds like a fairy tale gone horribly wrong. I look forward to tomorrow’s post. Chernobyl. The world must never forget. This post is a sobering reminder of a real life horror. I suppose that site will remain desolate for the long haul. Whoever took those photos was probably wearing a hazmat suit. I wouldn’t set a toe on that turf. I look forward to reading your post featuring Macaulay, but I empathize with your desire to take a break. Posting every day is something that is so demanding, plus you’ve got Phil, the kids and the critters and don’t you also work? When do you have time to sleep? You might consider just cutting back. For my first two years and about half-way into my third, I posted three times a week. That’s easy to do when you’re writing in a vacuum, but the more my site grew, the harder it’s been to write new posts and read and comment on others. Plus, I have my Manhattan Project that I hope to announce in the weeks ahead. Work-life-blog balance is easier said than done. I’m sorry you’re tired. If you do take a break, I hope it won’t be a long one. Perhaps by the time I’ve caught up on my reading–I’ve missed too many of your posts–you’ll be ready to return. By the way, I’m (finally) reading The Woman in Black, which I learned about from one of your posts. My break was needed, but then I had been blogging a while longer. I will miss you should you stop, but I understand the need for an occasional break. I’m not happy if you stop leaving that ghost wandering around your blog, it needs a holding post of more substance and less malice. Just chilling, Kate. And we watch as North Korea’s psychotic buffoon leader rattles his nuclear sabre. I’m all about taking care of oneself. I agree with Andra’s comment about a certain level of connection that would be difficult to lose, but I’ve been noticing how many long-time bloggers are saying “I need to slow down.” That seems reasonable to me. I probably didn’t need to say this since I think you already know it. It’s my way of telling you how much I enjoy your company! This post about the Chernobyl Nuclear Plant sent shivers up my spine. I’ve been writing a lot about how oil production in California concerns my from an environmental perspective, and one of the things that keeps coming up is nuclear power plants as an alternative. I have so many fears here…what a story, Kate. I have never heard about the Utopian city. Tragic! Come and live in Pripyat! It’ll be a blast! Kate, I enjoy your posts very much. They’re insightful, thoughtful, funny and educational. I also understand the need to take time to recharge and get re-energized. Take care of yourself and return as soon – and as often – as you feel best. The Chernobyl story is disturbing. My cousin lived near Three Mile Island in Pennsylvania when that nuclear scare happened. I interviewed her when I was working in radio news. Other places, like Love Canal in New York, where communities thrived and children played. How tragic that they became the source of health issues.